In just about 3 months I will be heading to Japan to learn the intricacies of tenkara. For 2 months I will be living in a fairly remote village, by the Maze river (Mazegawa) with the sole intent of learning more about different aspects of tenkara, while picking up more Japanese. I do not currently speak Japanese, and so far have been relying on my wife, on my good friends Masaki and Chikara. This time it will be a bit different, I’ll be staying in an area where hardly anyone speaks English, and for the most part I’ll be on my own. I’ll be renting a car to get around (aiii, a bit scary I confess). I’ll be going to different areas and will be fishing different streams with tenkara masters. SO, I MUST LEARN JAPANESE! …okay, maybe instead of writing this I should be studying more. But, I’m really excited about something. I just went to the central library here in San Francisco to look at the kids section on foreign books. They have a pretty good collection of Japanese books for kids. Among them I found the book pictured above. It is a kids book showing the life of a trout – Yamame – and talking about fly-fishing. It is a pretty neat book. I picked it up to become better with my recognition of Hiragana (one of the Japanese syllabaries) , and hopefully pick up a little more fishing vocabulary. What really got me excited about this book, however, is the fact that during Dr. Ishigaki’s visit to California he had a small towel with the same image. It must be a famous book, I just emailed him this picture to see what he says. 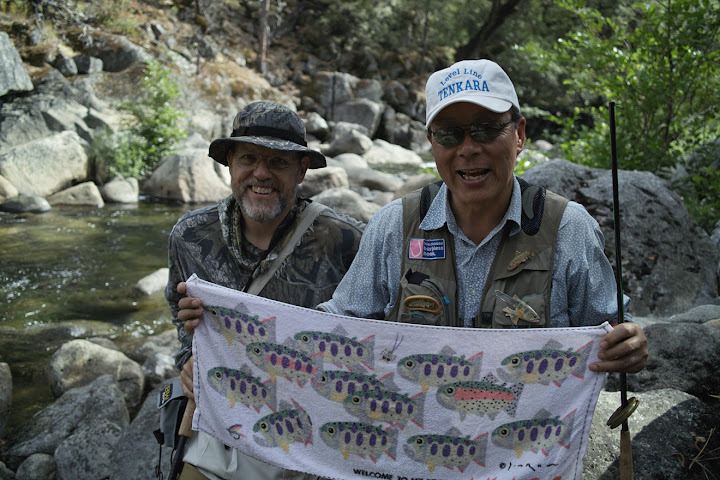 Here is Dr. Ishigaki with Chris “Tenkara Bum” Stewart with the said towel. About learning Japanese. So far I have been focusing on two things: deconstructing the language and learning the syllabaries (there are 2, Katakana and Hiragana…there is also Kanji, the Chinese characters that represent an entire word, luckily my background with Chinese will help a bit with that, but not by much). I have enrolled in classes 2x a week, but have been spending about 2-3 hours a day watching Japanese tv (little kids shows and sumo wrestling have become my favorites), reading kids books, and opening the pages of a couple of grown up books on tenkara and my favorite, Tsuri Kiji Sanpei comic books. We’ll see how far I can take this, I feel good about it this time. Years ago I tried to learn Japanese, enough to read on-line articles about how to do cube roots on a Soroban. I also used comics, a two volume set called “Managajin’s Basic Japnese through comics”. Google it and you can find it as an ebook and at Amazon – where you will also see another similar book ” Japanese the Manga Way” offered as part of a 3 book set. As for your extended stay in Japan. I can’t help being reminded of the book “The Needle Watcher”. About English navigator Will Adams who was ship wrecked in Japan in early 1600s. Later called the father of Japanese navy. It is it true story upon which the James Clavell’s book Shogun is based. Shogun was also made into a tv series back in mid 1970s. Of course the British Samuri Adams got his nick name from watching the compass needle . Whereas you will be watching the fly needle, aka sakasa kebari hook. Thanks for the suggestions on the books. Will definitely look them up. I just recently read Shogun, and it was actually pretty good. I have been wanting to see the tv series, but haven’t really looked for it yet. Looks interesting! Have a blast on your trip Daniel hope you learn a ton. I like the tenkara hat haha.